﻿The ﻿Journey's ﻿End ﻿is ﻿located ﻿on ﻿beautiful ﻿Ruth ﻿Lake, ﻿9 ﻿miles ﻿off ﻿Highway ﻿36 ﻿on ﻿Mad ﻿River ﻿Road ﻿in ﻿Northwestern ﻿California. ﻿We ﻿have ﻿everything ﻿you ﻿need ﻿for ﻿your ﻿vacation ﻿and ﻿we're ﻿just ﻿across ﻿the ﻿road ﻿from ﻿the ﻿Ruth ﻿Lake ﻿Marina. ﻿We ﻿offer ﻿first ﻿class ﻿food ﻿and ﻿drink, ﻿comfortable ﻿sleeping ﻿quarters ﻿and ﻿a ﻿convenience ﻿store. ﻿Enjoy ﻿local ﻿live ﻿bands ﻿performing ﻿summer ﻿weekends ﻿on ﻿the ﻿rear ﻿deck ﻿stage. 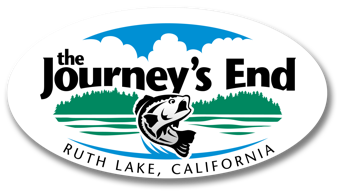 ﻿Come ﻿to ﻿The ﻿Journey's ﻿End ﻿for ﻿not ﻿only ﻿the ﻿first ﻿class ﻿food ﻿and ﻿service, ﻿but ﻿also ﻿the ﻿scenic ﻿drive ﻿through ﻿the ﻿World-renowned ﻿Redwood ﻿Groves ﻿(from ﻿highway ﻿101) ﻿or ﻿through ﻿the ﻿beautiful ﻿Shasta-Trinity ﻿and ﻿Six ﻿Rivers ﻿National ﻿Forests ﻿from ﻿I-5. ﻿Ruth ﻿Lake ﻿offers ﻿excellent ﻿fishing ﻿and ﻿water ﻿sport ﻿activities. ﻿Rainbow ﻿Trout ﻿and ﻿bass ﻿are ﻿generally ﻿abundant ﻿year-round, ﻿while ﻿large ﻿crappie ﻿and ﻿bluegill ﻿are ﻿most ﻿abundant ﻿in ﻿the ﻿late-spring ﻿and ﻿summer ﻿months. ﻿Catfish ﻿and ﻿Kokanee ﻿are ﻿also ﻿available. ﻿Water-skis, ﻿wakeboards ﻿and ﻿tubes ﻿comfortably ﻿share ﻿the ﻿lake ﻿with ﻿fisherman, ﻿and ﻿frequently ﻿the ﻿lake ﻿surface ﻿is ﻿like ﻿"glass" ﻿until ﻿the ﻿afternoon. ﻿There ﻿are ﻿beautiful ﻿campgrounds ﻿around ﻿the ﻿lake ﻿with ﻿great ﻿beaches ﻿for ﻿swimming, ﻿while ﻿the ﻿surrounding ﻿area ﻿offers ﻿deer ﻿and ﻿bear ﻿hunting, ﻿hiking, ﻿wildlife ﻿viewing ﻿and ﻿relaxation ﻿all ﻿in ﻿a ﻿friendly ﻿environment. ﻿The ﻿Ruth ﻿area ﻿has ﻿many ﻿attractions ﻿throughout ﻿the ﻿year. ﻿Come ﻿and ﻿compete ﻿in ﻿the ﻿Bass ﻿Fishing ﻿Tournament ﻿the ﻿first ﻿weekend ﻿in ﻿May. ﻿The ﻿Ruth ﻿Rodeo ﻿and ﻿dance ﻿attracts ﻿competitors ﻿and ﻿visitors ﻿from ﻿all ﻿over ﻿the ﻿state ﻿held ﻿in ﻿late ﻿July. ﻿The ﻿Ruth ﻿Lake ﻿Summer ﻿Festival ﻿the ﻿last ﻿weekend ﻿in ﻿August ﻿has ﻿food, ﻿arts ﻿and ﻿crafts, ﻿live ﻿music, ﻿a ﻿bicycle ﻿tour ﻿with ﻿3 ﻿stages ﻿of ﻿routes, ﻿a ﻿boat ﻿parade, ﻿a ﻿homemade ﻿raft ﻿race ﻿and ﻿fun ﻿and ﻿games ﻿for ﻿all. ﻿There ﻿is ﻿also ﻿a ﻿self-directed ﻿SUV ﻿"Poker ﻿Run" ﻿on ﻿the ﻿California ﻿Backwoods ﻿Discovery ﻿Trail. ﻿The ﻿Journey's ﻿End ﻿is ﻿one ﻿of ﻿the ﻿few ﻿full ﻿service ﻿facilities ﻿in ﻿the ﻿Ruth ﻿Lake ﻿area. ﻿Journey's ﻿opens ﻿in ﻿early ﻿April ﻿and ﻿stays ﻿open ﻿until ﻿hunting ﻿season ﻿ends ﻿in ﻿late ﻿October. ﻿Journey's ﻿is ﻿closed ﻿during ﻿the ﻿winter ﻿months. ﻿Come ﻿and ﻿make ﻿The ﻿Journey's ﻿End ﻿your ﻿summer ﻿vacation ﻿destination.